Saw this in The Evening Standard on the way home tonight and my first thought was am i in one of them or is somebody i know. The answer was no but still there was something fascinating about these candid shots of peoples routine trips up and down the London underground escalators. Called Escalators, this is the work of portrait and documentary photographer Belinda Lawley, who has turned hundreds of picture of Londoners into one piece of work. 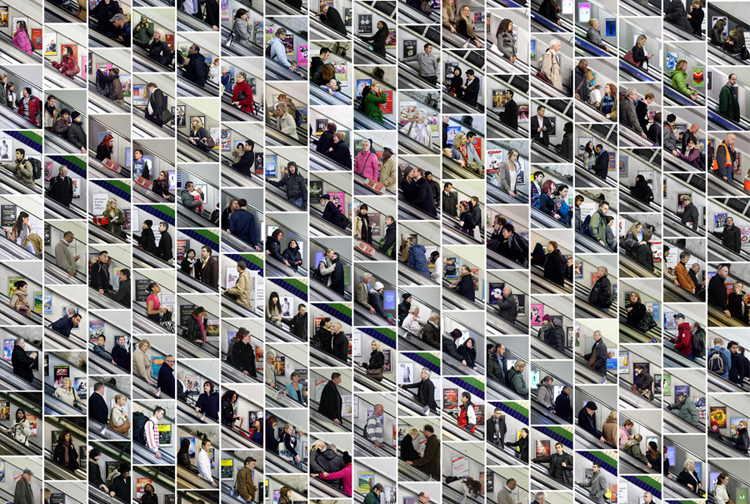 It comprises portraits of travellers on 14 escalators - each taken in one day. What makes this interesting is the way the individual images have been composed together to represent one giant multi-lane escalator. Turning the mundane into something intriguing, we like that. Just proves that inspirations can come from anywhere.